The coupon on the top is from Today, the one on the bottom from last week. The $200 Visa cards still spit out 2 of these–but the new $25 minimum changes the overall numbers and may make this deal less useful for you. Run the new numbers and see if this still makes sense for you. I’m leaving this post up because the deal is still technically alive–but consider the details before you go in on it. Update: As seems to be the case with recent Safeway promos this one isn’t working as advertised for some readers. Hit the comments for the most recent reports from readers. And thank you to all who’ve shared their experience with this. File this under a possible Mile-maker and a definate money maker. Currently there’s a spend $100 on Visa Gift cards, get a $10 coupon deal going at Safway stores. Not the best deal, Variable load cards to NOT work with this one. The deal is lukewarm–$100 visa cards are just too small to make this totally worth while, and Variable cards do not work. In fact I wasn’t even going to post this deal on the blog. With $100 cards only (non variable cards exempt) the best way to take advantage of the deal was to buy another GC with the $100 card. So buy a $478 variable load card and a $100 card, and net the $10 coupon. 200 miles @ 1x, 400 @ 2x, or $6/$12 back on a BCE/BCP. As you can see, even accounting for time and travel this is going to be a moneymaker for a lot of us. And since it can roll (use coupons from purchase #1, add a $200 card, get 2 more coupons), you could continue this for as long as it last. However you cut it this is a money maker and a miles maker. Stock up on miles and get groceries for free. Or stock up on groceries and get miles for better than free. Deals like this have been driving my cost per mile way, way down. Keep track of that with the Milenomics Purchase tracking sheet. And remember, things can change in an instant, obey (and fear) the float rule. So far I know this works at Vons, and Safeway branded stores. If you find it working in your store report back here. Look in your circular for the $10 back for $100, if you see it this $200 for $20 deal should work as well. In the first copy of this post I neglected to thank Milenomics reader Elaine, who alerted me to the original $10 off of $100 deal. As always, thank you Elaine! Only one coupon when I tried tonight in AZ. Thanks for the report Steven. I bought my most recent $200 just a half hour prior to posting this, so was live for me as of last night around 10pm Pacific. I’ll update the post with yours and Kim’s experiences. In my Safeway in NoVA, the $200 cards have a sticker with “cash only.” In the end, it didn’t really matter because no coupon printed out with the receipt for the $100 card. Had to chase down the manager who hand wrote me a coupon. Tok much work and too much attention. I appreciate the feedback Kim. 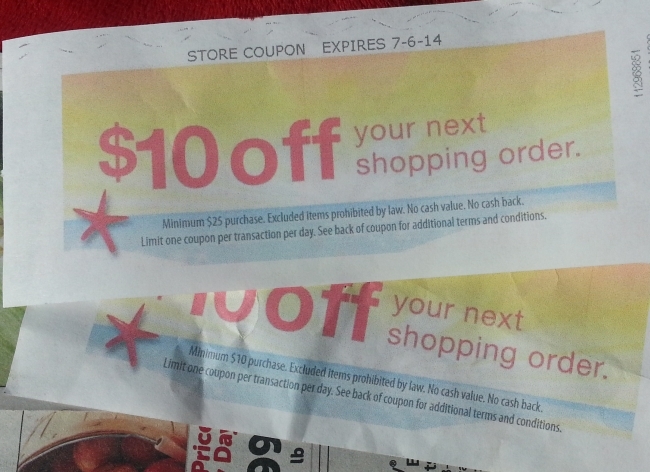 As it seems to be the case with these recent Safeway promos coupons sometimes do print, and other times don’t. I’ll update the post with your experience. Good job chasing down the manager and getting your $10. 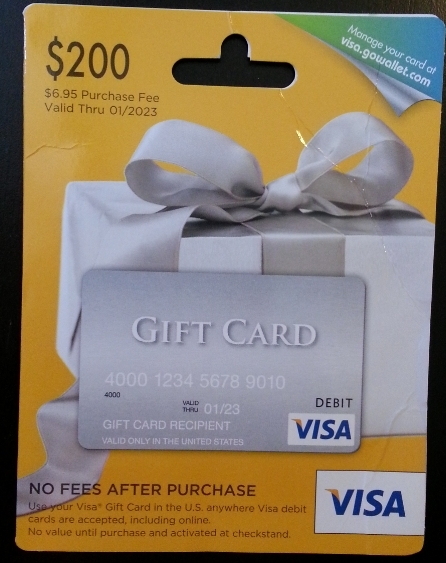 Any experiences with the $200 visa cards at randalls in houston area? My Safeway wont let you apply the coupon towards non-grocery items. I bought a $100 Visa with some gas gift cards and a 9.49 take-n-bake pizza. I had to throw in a little $1 item at checkout to use it. 5% Old Amex Blue + husband with a 6% Amex Blue Cash Preferred = a happy household. @Michelle S, did you get one coupon or 2? Any success in a randalls in texas? And you can see the $10 off of $100 is in the ad for this week. That *should* translate into this $200 glitch, but it also might not. What are you supposed to do with the $10 coupon? It looks like they expire. It might be difficult for a single guy like me to scale up my grocery purchases that much. Can they be combined on one shopping trip to get some kind of gift card? Can they be used to purchase Safeway gc? Or other merchant gc? $200 cards completely sold out here in Arlington, TX. Guess this “glitch” has gone viral. Thomas: another possibility is that the store manager pulled them due to the glitch… Either way thanks for the data point. Bought a $200 gift card at two separate Safeways in AZ yesterday and they both printed two $10/coupons. At the first store the cashier was on to me and knew that wasn’t suppose to happen, she was fishing thru the flyer when I came back to use a coupon a few minutes later. Still spit out two $10 coupons at one of the Safeway’s I went to yesterday…but it’s now a $25 minimum spending requirement. Bought a $200 card in rural AZ with my old Amex Blue. Two coupons printed. They indicate $25 minimum purchase required (have not tested this yet though). I tried to use one on another gift card, but the register would not take it. Jonathan: Yours and Randall’s comments both indicate the new $25 minimum is printing on the coupon. If this is true this deal has cooled off in my eyes. Unfortunately I’m not scheduled to return to my Vons for more purchases until tomorrow–so in the meantime anyone reading this should take Jonathan and Randall’s reports into consideration before going in on this deal. Thank you both. In related news, when I was at Fry’s (Kroger) today, I received a coupon for $5 off your purchase when you buy 2 or more Visa or MC gift cards. Valid July 2-15. It printed as soon as I entered my phone number for my club card. Not a huge deal, but every little bit counts. There’s no bar code on the coupon, so it looks like it will just be an automatic discount taken at the register. Jonathan: Does that include variable load cards? if so that could be pretty lucritive. Given the recent issues with CVS GC’s grocery stores are a good alternative. $5 back could cut your fixed costs nearly in half. After looking at it again, “coupon” isn’t really the right word for what I have. It’s more of a marketing flyer in the shape of a coupon alerting me to the upcoming promotion. The T&C on it do not disqualify variable load cards. It seems to me like it will be similar to this Safeway promo – buy two gift cards, get a $5 coupon printed out. It will likely be a YMMV, as I know my local Fry’s does not always allow me to buy higher denomination gift cards with a credit card. My guess is buying two $500 cards will raise some flags with some cashiers. You can download the Safeway app to easily track whether this offer is available locally. Anyone know the best way to use the 25 dollar coupons? If I buy a 25 dollar gift card, can I add $10 of non-gc items? It definitely will not let you add the coupon to another $200 gc purchase, as I tried that already. Scott: It depends on your state, as the coupon just says “excludes items prohibited by law.” At my store I’ve been told that means Dairy in California. I’ve yet to test if Alcohol can be purchased with the coupon, but it is an idea which I’m going to try to test. I am particularly interested in making the 25 minimum something other than normal items. I’m such a bachelor, that I don’t actually buy more than a little fruit and yogurt, and hardly ever more than $10 at a time. Scott: There is no work around buying normal items to make the minimum spending. Be creative, July 4th is coming up maybe you want to grill some steak, juice for mixing drinks, red bull for the late night, mentos :). If not, I’m sure you have to do the laundry Tide is $9.99 for 100oz at Safeway brands. Cheers! Amanda, thanks for the tip. Then my problems become, comparison pricing so I actually come ahead with the coupon since safeway is a bit pricier, deciding whether, at my T-rate it makes sense to do the shopping or the comparison for that matter. Oh, the compulsion, lol. The coupon itself says nothing about alcohol, so the cashier’s make up reasons (“coupons can never be used for alcohol purchases”). I don’t argue too strongly, in order to avoid becoming “that guy” whose future transactions are closely scrutinized. Miles: I agree–there’s bending, and then there’s breaking a good location. I like to buy my coupons at one store, and use them at a store which doesn’t sell cards to me on credit. That way the heat from one action doesn’t affect the other. So I was able to acquire $290 worth of free $10 off $10 minimum spending thru this promotion. Although the deal is now $10 off $25 minimum spend. Here are some tips I found thru the $200 purchase. Safeway in colorado gives the dreaded “after spending 25” coupons! Anyone know if the coupon can be used for a gasoline purchase?